What do you think of Tempest Rebirth design? 2: But I really was torn between 2 and 3. It's really not a bad costume, though it's over-designed, of course. That's a standard boilerplate for the modern era. The basic concept is pretty solid, with the armored upper and sleek lower, but there are several things that don't quite work. The scales continuing onto the lower half, the weird belt bit, the blue on blue, etc. Make the upper part red and I think you've got something. 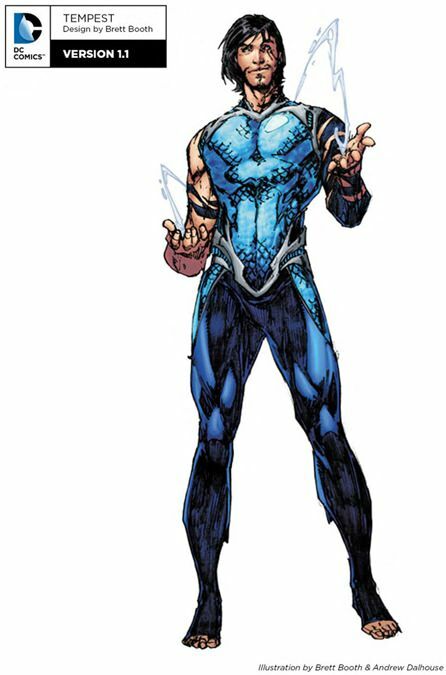 I would be glad to see Aqualad back, except that this character seems to have nothing really in common with my old favorite and was denied any history by just being dropped, fully formed, like Athena, into the middle of the DCU. Actually, I feel like it's more of an homage to his design from the Teen Titans cartoon, which I personally rather enjoyed. Additionally, I'm glad they kept him in Blue rather than red... I'm sorry, but after years of ALL THE RED ON EVERY CHARACTER EVER (Including freaking BEAST BOY!?! REALLY DC!?!) I feel like the current version of the Titans is a lot more balanced as far as colors. Still, it could be far better, and I do wish he had the Atlantean "cha" or whatever the heck DC has calls the "A" belt buckle. This one is pretty cool. Sleek and not horribly over complicated. Although, drawing the belt from every angle would be a bit of a pain. Why are just his toes showing? Yeah, unless the toes are webbed (shades of Man From Atlantis ), then having them uncovered is just a fussy bit of excessive design. I agree with Benton on e flow of the scales to the lower section, and the belt looks funny. It's like a couple of other belts, except this one is more obvious: it points at his naughty bits, and this one looks like it's going to circle around them and lift them up for all to see. Cover the toes, put a belt a little less elaborate on him, and stop the scales at the belt, and this isn't a bad costume at all. I like the blue. Does everyone from Atlantis have water-manipulating powers these days? I mean, Young Justice literally showed an Atlantean magic school where even novices could manipulate water like Aqualad. Yeah, I'm guessing that's the angle they're going for, and that's fine. I've always liked Atlantis to have some magical elements. Count me down for a Like, but there's a few things I'd change. The pants would look better if they were a darker blue - I wouldn't be surprised if that's the way they're coloured in the actual book. The belt is a little too complicated. I'd get rid of the extra pieces at the sides. Like Benton I think the lower scales should be removed, it unbalances the design. On a non-costume note I'm not huge on the tattoos, hair, and facial hair. Gives him a grunge kinda look, but maybe it works if I was reading the book. Anyway the positives, the blue scale top, the silver belt and the navy leggings is a great combo. Very sleek. It takes the basic Aquaman setup but the cut here is cooler. Pod, I agree about the extras, like the tatoos, etc. But that has more to do with what I want from the character than aesthetics themselves.